There are a number of features or qualities belonging to the Volga German ethnic group that allow us to uniquely identify it from the time of their first arrival in 1881 up to the 1940's and 50's when assimilation and dispersion broke down the community. The Volga Germans were accustomed to living as a minority surrounded by a much larger majority. Far from their ancestral homeland in Germany and Western Europe, the Volga Germans evolved as an isolated group where their language, traditions and beliefs separated them from the larger Russian population. They become comfortable living outside the mainstream in mostly self-supporting communities. They saw themselves as different from their neighbors. 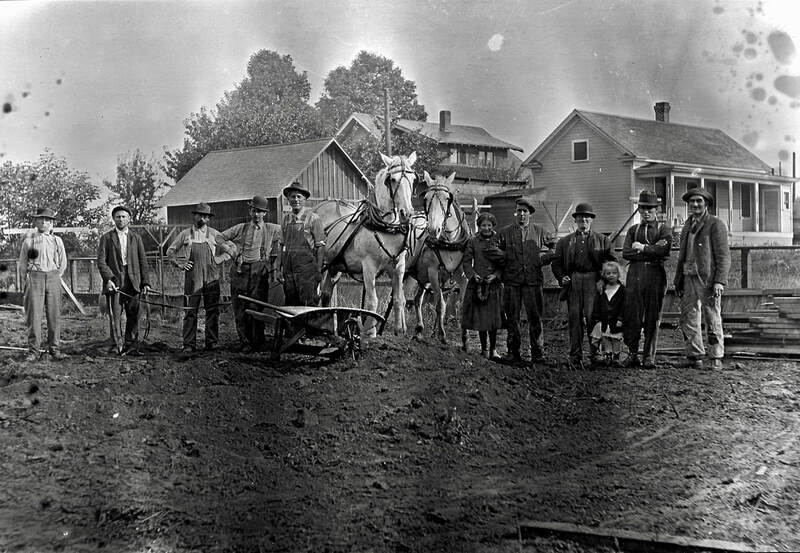 The community in Portland began as if another colony were being formed in Albina. Most of the early pioneers came from the same a single colony in Russia (Norka). They chose to live in the same area in NE Portland, went to churches formed by Volga Germans, shopped in stores owned by Volga Germans, and generally married within the ethnic group. The clannish behavior that was common in Russia, was simply transferred to the new settlements in North America. Few outsiders clearly identified the Volga Germans as a distinct ethnic group. The Volga Germans kept to themselves and preferred to keep a low profile, especially during the war years when people did not differentiate between Russian-Germans and the Germans of imperial or facist Germany. Although a few historical works, such as Kimbark MacColl's The Shaping of City correctly locate the ethnic group on a map, the history of the Volga Germans in Portland, and more broadly in Oregon, has been largely overlooked by historians who are simply unaware of its existence. The Volga Germans, content to be "under the radar" did little to raise their profile in the broader community. A common German dialect perhaps created the strongest bond. This was not the modern German language, but an old Hessian dialect carried to Russian by the colonists who settled there in the mid-1760's. Immigrants from Germany often did not consider the Volga Germans as fellow Germans. They considered them to be Russians - a designation the Volga Germans did not warmly embrace. As a result, there seems to be only limited interaction between the two German ethnic groups. In the early decades of settlement in Portland, families were often large, as they had been in Russia. It was not uncommon to have ten or more people in a single family unit. Aging parents often lived with one of their children. In preindustrial agricultural societies, children were a valuable, productive asset – even a six-year-old child could carry out essential household tasks. In Russia, the need for helping hands, combined with a lack of modern contraceptives, led to large families despite relatively high infant mortality rates. As the community transitioned to an urban and industrial society in America, family sizes decreased over time. Religious beliefs and practices were another important element that bonded the community together. Most people attended church as it was not only the source of spiritual life, but served an equally important role as the center of social life. A skepticism about government was common. Given their sometimes unhappy experiences as subjects of German nobility and in Russia living under numerous Czar's, there was inbred distrust of officials and those in power. The Volga Germans typically did not engage in political activity. In the early years, the Volga Germans continued to wear traditional clothing that was typical to their lives on the Russian steppe. Women in black or brown shawls could be seen in the neighborhood or gathered outside the church on Sunday. The men more readily assimilated their clothing as they worked with people from other ethnic groups where conformity was more important than tradition. The temperate climate of Portland made heavy sheepskin jackets and felt or leather boots unnecessary. The Volga Germans were typically very frugal. They bought or built their own modest cottage homes in Albina and generally paid in cash. Richard Sallet states that based on the 1920 U.S. Census, over 95 percent of the Volga Germans residing in Portland owned their homes. Whatever your level of income, it was always important to keep your home and yard well maintained. Reuse of household items, composting, making their own clothes, patching worn clothing were all very common practices. Many people had their own gardens and fruit trees. Canning and pickeling food was the norm. Many people also kept a few chickens for eggs and meat. A practice that's again become popular in Portland! Many recall the annual ritual of transporting and stacking 10 to 12 cords of wood which was moved from the curb to the basement where it fueled a wood stove during the winter. The work often started in March and continued through August. Hard work was one of preeminent characteristics of the group. In the early years, advanced education was not highly valued. The women worked to maintain the household and often held jobs working as domestics or as laborers in factories. The men worked in the rail yards, maintaining streets, collecting garbage and other physical jobs. They lived by their motto, "Arbeit macht das Lebens süss" or "Work makes life sweet". After escaping war, poverty and famine in Germany during the 1760's, and a century later fleeing from many of the same horrors in Russia, the Volga Germans certainly found Portland a sweet place to call home. Brill, Conrad. "Memories of Norka." Journal of the American Historical Society of Germans from Russia 8.2 (1985): 1-16. Web. 30 Mar. 2016.